Hello there! Renee here from Fantastic First Grade Froggies. Summer is here in my neck of the woods and you would think that school would be the last thing on my mind, but I feel like I am always thinking of things I can do. One of the things I wanted to re-do this summer was a couple of paperwork items I send home for parent the first week of school. Our office gives me a copy of each child's student info sheet, but honestly it always has tons of info I don't need. 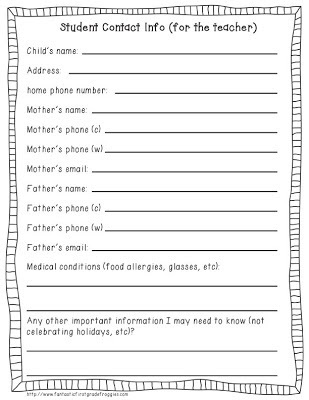 So, I make up a simple one for the parent's to fill out. I keep this one in my teacher binder, so I always have the contact info nearby. 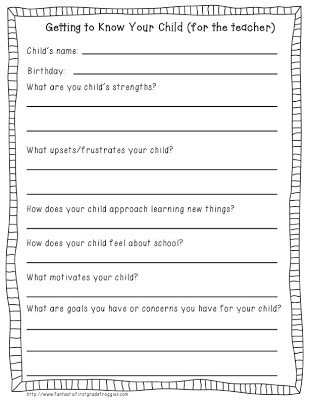 In addition to the student contact info, I love to get some information about the child from the parents point of view. I really enjoy reading their responses and often revisit their concerns during conference time. If you would like copies of these, click on the picture above or below. What do you do send home for parents to fill our the first week of school? I would love to hear your ideas. Thanks for sharing the student info. forms. They will be a big help at the beginning of the year! Thank you for sharing this. It will be a big help for students who are transitioning to the middle school!